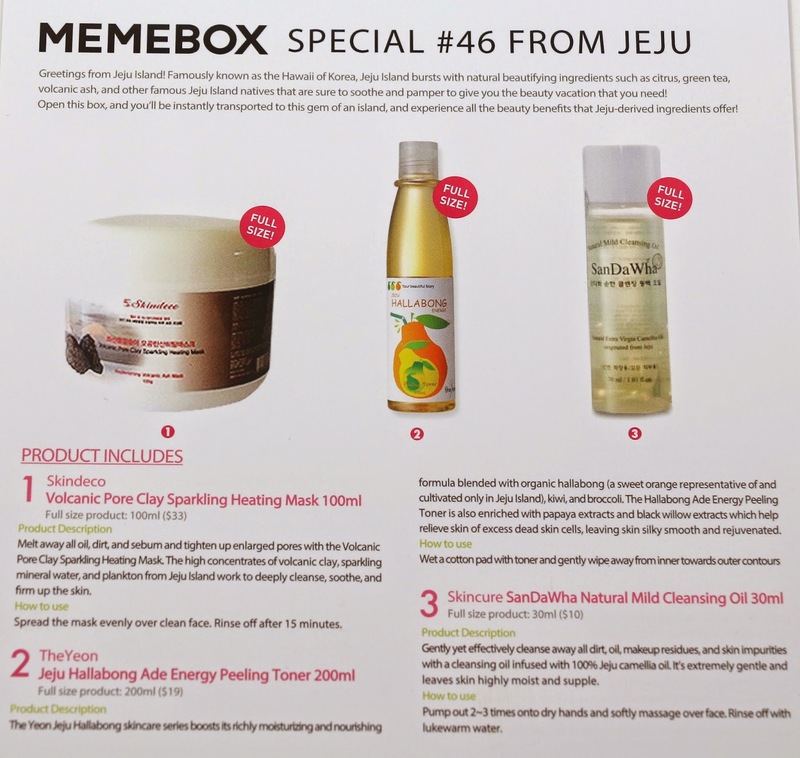 My Memebox Special #46 From Jeju box got here a little while ago, and I'm finally getting the review up. I was really looking forward to this box, and it almost lived up to my expectations, but not quite. This box was shipped via Registered Mail and delivered by USPS in 12 days from Korea to California. 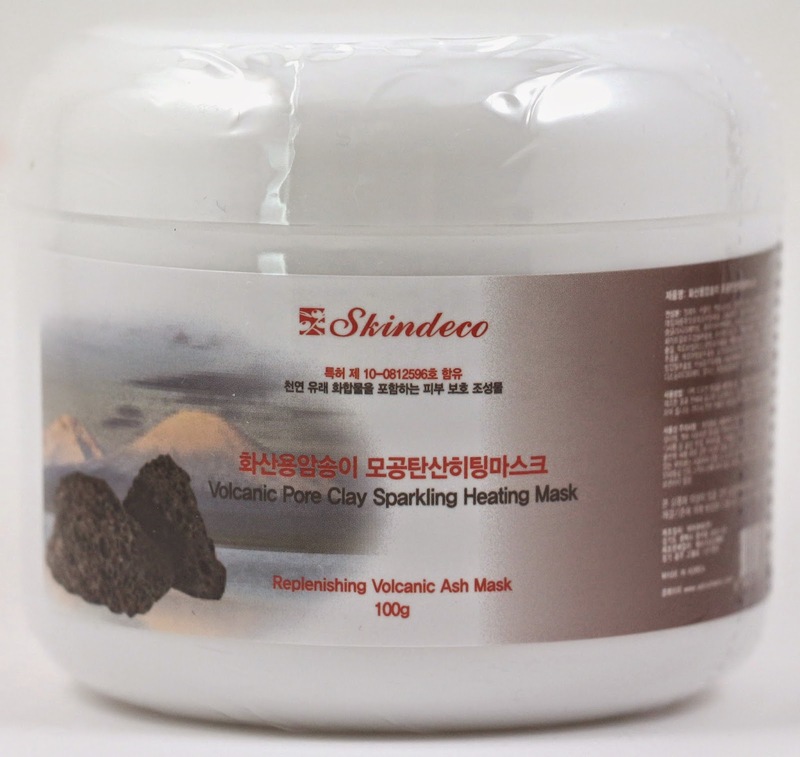 Product description: "Melt away all oil, dirt, and sebum and tighten up enlarged pores with the Volcanic Pore Clay Sparkling Heating Mask. The high concentrates of volcanic clay, sparkling mineral water, and plankton from Jeju Island work to deeply cleanse, soother, and firm up the skin." How to use: "Spread the mask evenly over clean face. Rinse off after 15 minutes." My thoughts: I haven't tried a heating mask yet, so this product should be interesting. How's that packaging though, it looks pretty cheap. Product description: "The Yeon Jeju Hallabong skincare series boosts its richly moisturizing and nourishing formula blended with organic hallabong (a sweet orange representative of and cultivated only in Jeju Island), kiwi, and broccoli. The Hallabong Ade Energy Peeling Toner is also enriched with papaya extracts and black willow extracts which help relieve skin of excess dead skin cells, leaving skin silky smooth and rejuvenated." How to use: "Wet a cotton pad with toner and gently wipe away from inner towards outer contours." 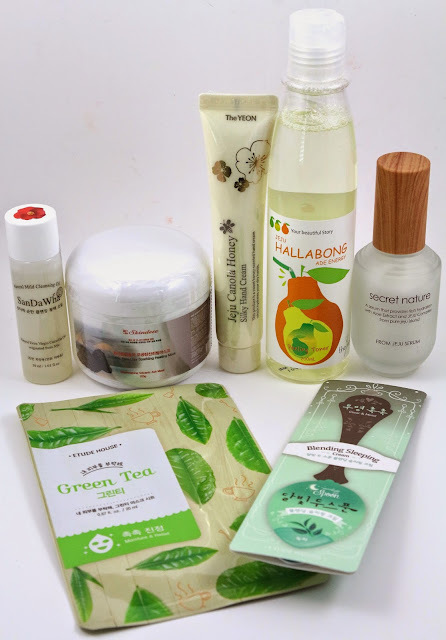 My thoughts: I love toners, they have become one of my favorite products in Korean skincare. I am so glad to get another, especially this one that's so big. Product description: "Gently yet effectively cleanse away all dirt, oil, makeup residues, and skin impurities with a cleansing oil infused with 100% Jeju camellia oil. It's extremely gentle and leaves skin highly moist and supple." How to use: "Pump out 2-3 times onto dry hands and softly massage over face. Rinse off with lukewarm water." My thoughts: I think this is the first cleansing oil I've received from a box, which is good because I think I only have one cleansing oil in my stash. 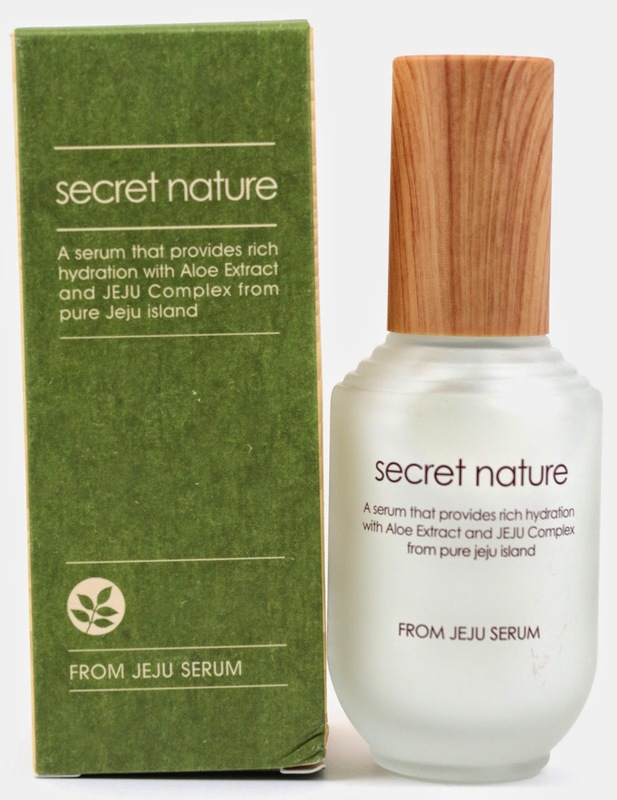 Product description: "Enriched with Jeju complex - organic broccoli, carrot, aloe, and asparagus extracts - Secret Nature From Jeju Serum delivers rich nutrition and instant moisture surge deep down into skin. 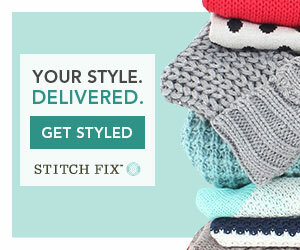 It's free of paraben, artificial coloring, benzophenon, talc, TEA, and artificial fragrance." How to use: "Apply directly to skin and pat it in for full absorbance." My thoughts: I love serums, and I have a ton from the Secret Nature brand. I just love their packaging, it's really classy looking with the wooden cap. Product description: "A one-time sleeping cream packed with abundant nutrients from green tea cultivated in the Jeju Island. It's highly effective in soothing and moisturizing skin at the end of a stressful day." How to use: "Take out the spoon from its package and separate the handle part of spoon by breaking it apart. Use it as a spatula to scoop up the pack and spread it evenly over clean face. Rinse off with lukewarm water the next morning. Make sure to apply the pack at the very end of your skincare routine as an overnight treatment." My thoughts: This is such a strange way of packaging a one time use sleeping cream, but sometimes I can appreciate one time use products. 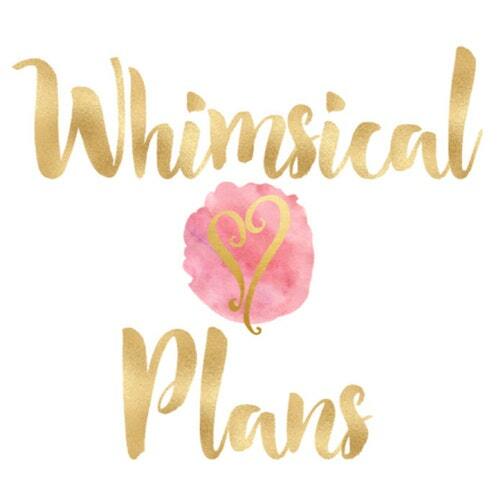 That way I can use them up quickly and this is a good brand, and I like green tea products. 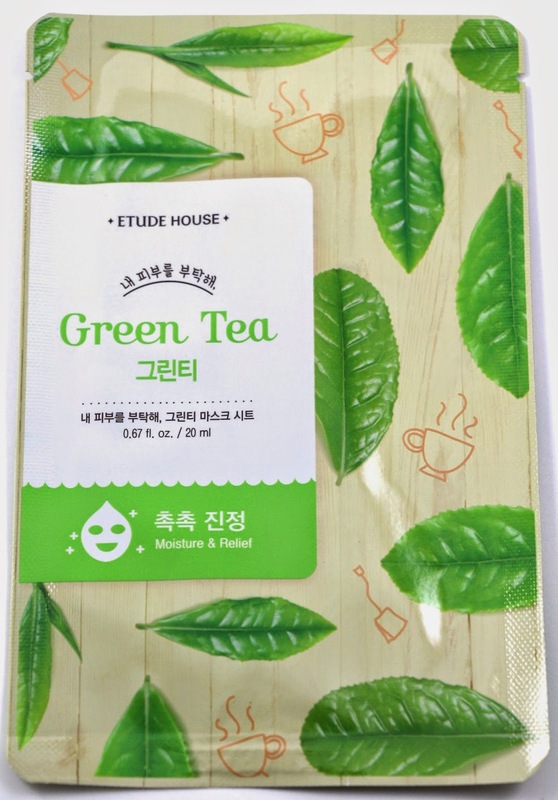 Product description: "Relieve, hydrate, and brighten skin with extracts from young green tea leaves, widely acknowledged for their soothing and moisturizing effects. More than anything, they're gentle to skin and can be used by all skin types." How to use: "Unfold and spread sheet mask over face. 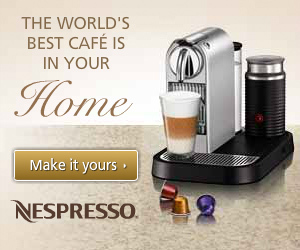 Remove after 15-20 minutes and gently pat to fully absorb remaining essence. Use 2-3 times per week." My thoughts: Even though sheet masks are only one time use, and don't usually have much value, I love sheet masks. If there could be a sheet mask in every Memebox I would be happy with that. Product description: "Replenish and nourish dry, roughened hands with honey-scented Jeju Canola Honey Silky Hand Cream. It'll make your hands silky soft and help maintain a well-balanced moisture level." How to use: "Apply directly to hands as often as needed." 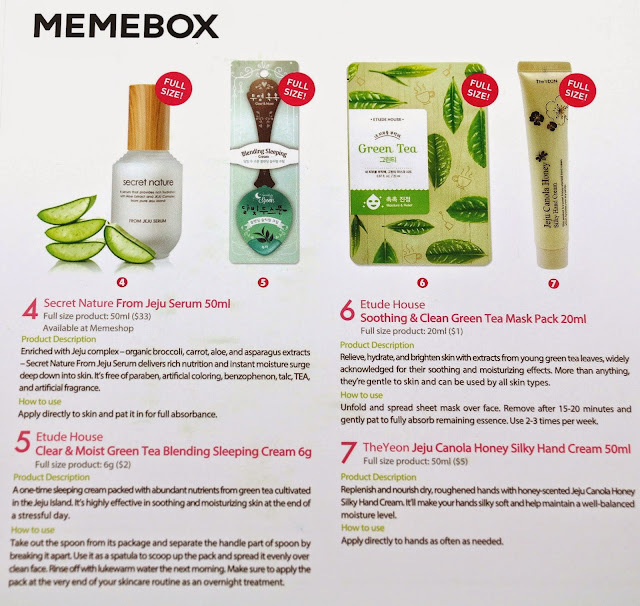 My thoughts: I hate getting hand cream in pretty much every Memebox. I buy my own hand cream that I like, and I don't need more just taking up space. So it's safe to say this will probably be donated, or swapped, or thrown onto the neighbors lawn. Overall, the Special #46 From Jeju box had a total value of $103, and I thought this box was pretty good. It had a lot of things to like about it, including that there was a really good variety of products. There was a mask, a toner, cleansing oil (which isn't included in boxes very often), a serum, a sleeping cream, a sheet mask, and a hand cream. I didn't like that 3 of the items were a very low value, and 2 are one time use. I also didn't like that there was another hand cream in a box, I may as well donate them at this point, I have too many. But other than that, I liked this box. And I always welcome another face mask.